(Nanowerk News) ProIMAGE Contest 2010 is a competition of AFM-images obtained with NT-MDT probes. The main aim is to collect image gallery of the scans showing the best application of the probes in great variety of research in different spheres and objects (cells, molecules, atoms of the organic and non-organic materials, minerals, soil, bacteria etc.). 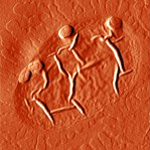 The participants sent their AFM-images for 4 months. The total quantity was 170 scans. And the scans of ProIMAGE Contest 2010 were really amazing, scientifically and aesthetically interesting. The final TOP-40 consisted of TOP-10 of August, September, October and November. All of them were elected by open on-line voting. And in January 2011 the jury chooses the best scan. Ms. Alexandra conquered the jury. As she said her dancing creatures were made of polyvinyl alcohol film contained tripsin. 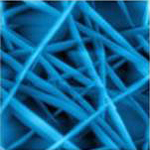 It was a crystalline part of polymer film. But the result we can see is vivid and unusual. Wonders of science and engineering! Ms. Sertsova works at the Moscow State Textile Institute. “A.N. Kosygin” at the Department of the technology of the chemical fibers and nanomaterials, and in parallel studies in graduate school in the Russian Chemical and Technological University “D.I. Mendeleev” at the Department of nanomaterials and nanotechnology. Her research interests are quite extensive: atomic force microscopy of textile and plastic materials, development and creation of nanocomposites with special properties, and others. 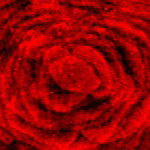 The red rose for beautiful ladies is the AFM-image of Cu film on Fe-Si/Si(001) in UHV-chamber. SemiContact regime was used. Mr. Kitan works at Far Eastern National University and researches atomic processes of metal-semiconductor nanostructures based on metals, silicides and Si in Physics departure. His scientific interests are oriented to the research of electronic, optical and morphological characteristics of transition metals on Si thin-film nanophases by spectroscopy and SPM methods. The laboratory of the University equipped with NTEGRA Spectra and SOLVER P47. Ms. Clare Harvey (Utrecht University) presented to the jury the AFM-image of Rhodamine-6G and Ag nano-cubes deposited on a polished alumina wafer. 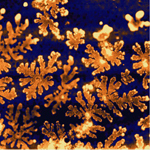 The sample was dried in a flow of warm air, leading to the unusual structures and looked like flakes of snow. USD 2500 for the 1st place! NT-MDT Co. thanks the participants for the excellent AFM-images.